Oooohhhhh!! I get to be the first to FAV!! So I will. Beautiful is not enough, but it's all I have. And one WOW. Wow, this is just amazing! Stunning composition and cropping, a fav, of course! Beautiful!!! I love the statue in the background! Definitely a fav. I like the pov and gentle light. Well - easy - fav! Love all the detail you have in the tower. Another nice one, Helene ... and another Fav! Fav. The framed statue is so beautifully framed! FAVE. I just love this so much. I can sooo see this framed on my wall. Oh WOW! Beautiful. 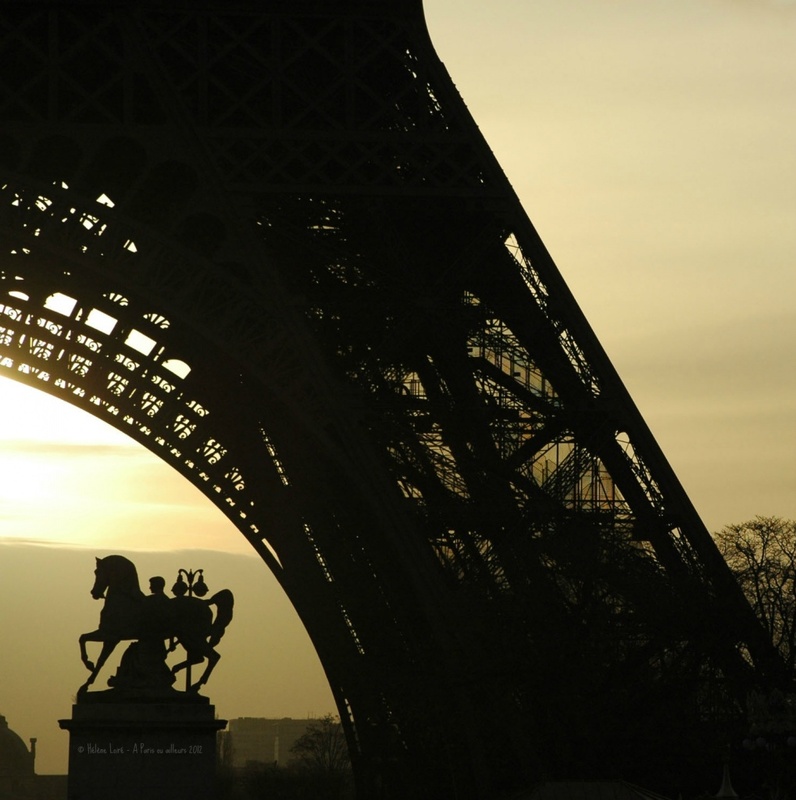 I think I will have to put sunrise at the EIffel Tower on my list of things to do when I am there!! I love this! The horse statue is framed so beautifully - fave! I love it--wish I could be there now! Is it made with lace or medal? Great POv too! Awesome shot Helene. Love it. thank you, thank you, thank you...so beautiful! A fav - so very stunning! Fantastic sunrise shot! I love how you captured the statue through the arch of the tower! I love how you didn't get the whole eiffel tower, but just a part of it! really different! Never been. Want to go. BTW, I'm back for another round in 2012. Look forward to following you again. Wow! the silhouette and colours are fabulous!! LOVE LOVE LOVE!! Fav for me! How did I miss this?! Immediately a favorite. This is spectacular. just wonderful! I so want to come back to Paris one day. One of my favourites so far of your eiffel tower views! This is a wonderful and different shot! What an excellent shot! wow! @helene yup first trip to Paris and can't wait. It's right on doorstep so should have gone ages ago lol. Stunning. Making it a FAV. Beautiful. That would look stunning on a canvas on a wall! I thought of lace, too when I saw this. lovely. This has been on the PP for what seems like days! Such a fabulous shot. I have often seen your pictures, occasionally commented but later this year we are returning to Paris for the 3rd time and I just have to get myself in gear and follow you!! Hopefully I shall be inspired and see some hidden places :-) A fave of course! I really love this! Great framing/composition! @Cherrill Thank you very much, if you need tips, like places you liked on my albums and wanna visit yourself, just ask me! Very cool look at it. Really like this shot. Loved Paris.